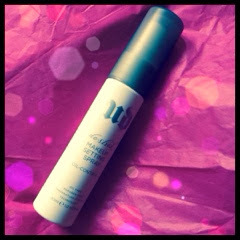 My new love, Urban Decay's De-Slick Makeup Setting Spray! I find that it really manages the part of my face that gets shiny throughout the day. All this while I've been solely using powder, and while that has worked, it also made certain parts on my face looked a little cakey and dry. This awesome creation of man however had helped me eliminate that cakey bit on my face! Yayy! This is just the travel size (RM 49, have not checked out the full size bottle), because I really just wanted to try it out to see if it really does anything for me. Now that I know that it does, I will have to purchase the normal size once this is finished! And I love that the packaging comes with a double cap! No regrets on coming back to Sephora just to get this last month! The normal full size setting spray is retailed at RM 109 but the one that was meant to prep your face with some vitamin is slightly more. I just bought myself the travel size of the All-Nighter from Sunway Pyramid (seems like different Sephora stocks different versions of the travel sizes) and I am going to try that once my De-Slick runs out.